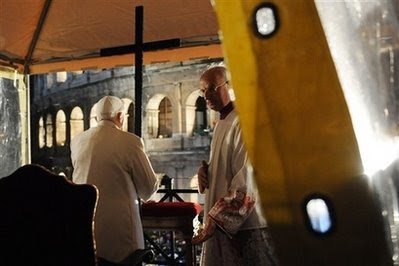 Pope Benedict XVI presided over the Good Friday night Way of the Cross procession at the Colosseum during a driving rainstorm but did not carry the cross as planned during the tradition, which was dedicated to religious freedom this year. The pope wore a long white coat as he stood sheltered from the cold, pelting rain under a canopy erected on the Palatine Hill overlooking the Colosseum. At the end of the procession, Italian Cardinal Camillo Ruini handed Benedict the tall, slender, lightweight cross. The pope gripped the cross briefly. Then, in a strong voice, he blessed the crowd of thousands being drenched by the rain and buffeted by gusty winds and told them: "Thank you for being patient under the rain. Happy Easter to you." The pope was supposed to carry the cross for the final minutes of the more than hour-long procession, taking his turn after a young woman and a young priest from China walked with the symbol of Jesus' crucifixion. But Vatican officials said that because of the storm, it was decided that the pope, who turns 81 next month and has two more days of strenuous ceremonies in the days ahead to mark Easter, should stay dry under the canopy.